Do you ever feel overwhelmed with everything you have on your plate? Feel like there's just not enough hours in a day to accomplish everything at home and church? It's a tension that you must learn to manage if you want to go the distance in ministry. In my coaching program, I ask everyone that is participating this question. Can you go the distance with your current pace? Often, the answer is "no." What about you? Can you sustain your current pace long-term? Let's go a little deeper, Can you sustain your current pace and be happy? And be a good parent? And be a good spouse? Being fully present when you're at work and fully present when you're at home is not an easy task. But it can be done with the right strategy and commitment. 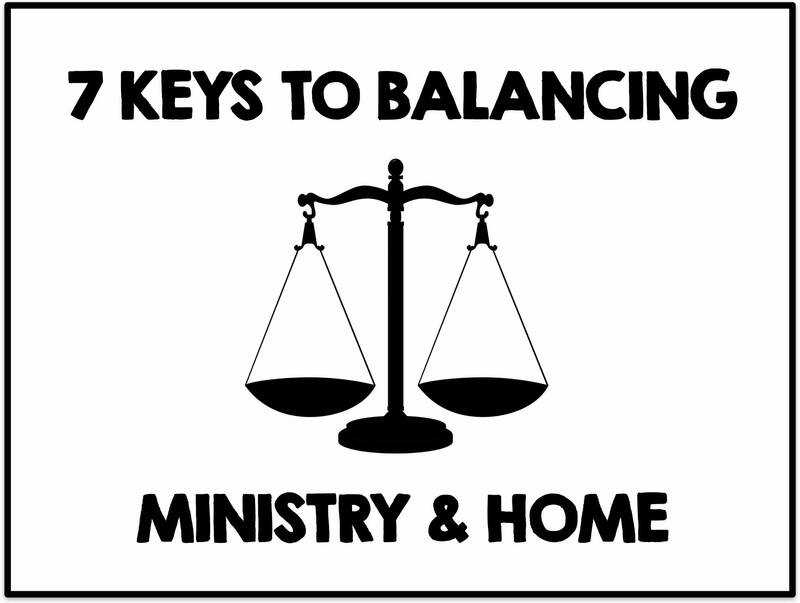 Let's talk about 7 keys you can use to keep home and ministry balanced. Key #1 - Work when you are at work and then get home. Sometimes when someone says they are always at the church working, they may be at the church, but they may not be working as much as they think they are. Take out an extended lunch, time on social media, time just chit-chatting with co-workers and time just goofing off, and those "long hours working" at church are reduced. If you want more time to spend at home and with your family, then get your work done and go home. This doesn't mean you can't have fun or any relax time at work, but it does mean you are focused and not wasting time. Key #2 - Set time for your family on your calendar just like you would for a ministry appointment. You know what happens. You have a date night planned with your spouse. But an afternoon phone call comes in that a couple is about to divorce and want to come talk with you that evening. What should you do? Drop the dinner with our spouse and meet with them? Not if you already have an appointment that evening with your spouse. Just kindly let them know you already have a meeting that night, but you'll be glad to meet with them the next day. And don't feel "guilty" about it. How are you going to help other peoples' marriage if you don't have a strong marriage yourself? How will you teach a parenting class if you don't spend time investing in your own child? Key #3 - Know the season of life you are in. Seasons of life can heavily influence how you do ministry. If your kids are in preschool or elementary, you will need to be home more in the evenings and block out time for them. When you become an empty-nester, you will have more time available to do things you want to do. But right now focus on your children. They will be grown and gone before you know it. You only get one chance to raise them. "Don't blow it by making building the church more important than building your children." Key #4 - Learn to say "no." If you study the ministry of Jesus, you will see that He didn't heal everyone. There were times He said "no" and pulled away to spend time in prayer and resting. Often, people in ministry are people pleasers. We are wired to be available to serve people whenever they need us. But if you don't stay balanced, you can end up losing your own family. And then you'll lose your credibility to minister to others. Sometimes you have to say "no" to something that is good, so you can make something else great. If you're going to go the distance, then learn to say that powerful little word - no. Key #5 - Take your day off and use your vacation time. Many leaders fall into the trap of not taking their day off. They tell themselves they are too busy. Sunday won't happen if they take a day off. And the longer they stay in that mode, the harder it is to be balanced. Here's a little tip that I wish I'd have thought about when my kids were younger. Rather than spending major dollars on buying your kids "stuff" at Christmas and on their birthday, cut back on what you spend on "stuff" and instead use the money to make some memories with them. Go on a road trip. Take them to an amusement park. Take them on a camping trip. Go snow skiing together. Here's the reasoning behind it. Kids will quickly grow tired of the "stuff" you buy them. But they will never forget the trips you took with them. They will never forget the money you spent making memories with them. They will always remember the time you camped out or sang Christmas carols by a campfire or went bowling as a family. "Spend more time and money making memories with your kids, than you do filling their toy box up." Key #6 - Set a quitting time and obey the clock. Have you ever looked at the clock at work and it says you should go home. But you tell yourself you've just got to finish up what you're working on. You just need 20 minutes to wrap it up. 20 minutes later you look up and tell yourself it will only take 10 more minutes. It keeps going and when you finally arrive home, dinner is cold and your spouse has already put the kids to bed. This happens quite often and eventually becomes a pattern for you. Your spouse tries to get you to come home and spend time with the kids. You listen and know he or she is right, but you just can't seem to get out of the grip of "what I have to accomplish." If that's the case, then it's time to set a quitting time that will get you home in time for dinner and keep you there engaged with your family. Let 5 o'clock be your boss and obey him and go home. What you are working on, will be there tomorrow. Of course, there will occasionally be things pop up that you can't control or push to tomorrow. But that should be the exception and not the norm. Key #7 - Maximize your time by managing your time. What if you started managing your time more closely? Identifying what you are doing that shouldn't be warranting your time? Maximizing your time by organizing and prioritizing your tasks? You will be surprised how much time you can get back. I share several time management tools in my coaching program that can help you be more productive and more balanced at the same time. You can get more information at this link. I know by experience that when you become unbalanced, it will catch up to you and you'll look back and regret not having balance. I had to learn the hard way that balance is a non-negotiable, if you want to go the distance and finish strong. Not being balanced can take you down for the count. It took me down and I almost didn't make it back. You can read about what happened at this link. As a ministry leader, you have to keep a lot of plates spinning, don't you? The ministry plate...the family plate...the chores plate...the hobbies plate...counseling plate...preparing lessons plate...event plate...friends plate...there is no shortage of plates we have to keep spinning. But there will be times when you simply can't keep all those plates spinning. When that happens and you have to decide which plate to drop...do one thing...make sure you don't drop the family plate. Your turn. How do you keep your ministry responsibilities and family balanced? Share your thoughts with us the comments below. Very good article and timely for me personally. Juggling family with ministry is a challenge and your points are valuable and useful. The transition from singlehood and having all the time in the world, to marriage and family can make you wonder how do I balance everything? You want to fulfill the will of God but it's like we forget that ministry begins at home. Thank you for putting this article together.